Any bible in print, on a website or in an online database. Structure: Bible Title. (Edition. ed., Vol. Number.). (Year). City: Publisher. 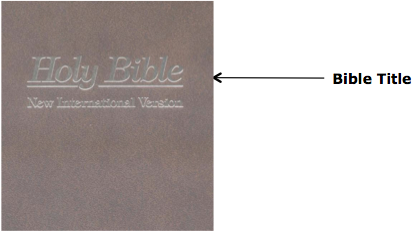 *Vol Note: Not all bibles will have edition or volume numbers. Citation: The Holy Bible, New International Version. (1984). Grand Rapids: Zondervan Publishing House.